My name is Danita Catherine Burke and I am an international politics and Arctic politics scholar with over 12 years of experience doing Polar research. I am from Newfoundland, Canada and I current live in Denmark. I have an undergraduate (honours) degree in Political Science with a minor in Business and a graduate degree in Political Science from Memorial University of Newfoundland. I have also completed a PhD in International Politics at the Department of International Politics, Aberystwyth University in Wales, UK. I am currently based at the Center for War Studies, University of Southern Denmark where I was first a Carlsberg Foundation Distinguished Postdoctoral Fellow and I am currently a Marie Skłodowska-Curie Individual Fellow. My current project focuses on NGOs in the Arctic region and is supported by a Marie Skłodowska-Curie Individual Fellowship, but my research covers a range of themes. These themes include diplomacy and cooperation, legitimacy, institutional and organizational practices, evolution of national identity, environmental non-governmental organizations (ENGOs), and the role of militaries in the Arctic. I started the Women in the Arctic and Antarctic (WiAA) initiative in 2018 with the aim of helping to provide tools to promote women pursuing Polar research on the North, Arctic, and Antarctic. All too often avenues for women to promote themselves in their chosen field are limited thereby impacting their career advancement opportunities. The WiAA initiative aims to shine light on the women who pursue Polar research and to help women have opportunities to promote their work and to have access to information that can help them with research and career development. The initiative presently has two primary tools to help promote women – the Twitter @arctic_in account and the www.womeninthearctic.ca website. Polar research is a global field and for many scholars, limitations such as funding, scheduling restrictions, geography (e.g. distance to events), and family responsibilities impact their ability to attend many traditional networking opportunities, such as conferences and workshops. The result is that the lack of access to traditional networking opportunities can cut women off from chances to develop as a Polar scholar, limited their capacity to introduce themselves to other Polar scholars, and hinder their ability to learn about existing and emerging funding, networking, and research resources. Through the WiAA @arctic_in Twitter account and the www.womeninthearctic.ca website, you can learn more about funding and research opportunities available for various types of Polar scholarship and samples of publications by women doing Polar research. You can also learn more about networking and fieldwork opportunities and requirements for undertaking Polar scholarship in different parts of the Polar regions. Most importantly, you can read new profiles, written by Polar scholars, introducing themselves in their own words to generate awareness about their work. With the launch of the WiAA website, WiAA welcomes you to come and learn more about the amazing women doing Polar scholarship. The WiAA website features profiles by scholars such as Aki Tonami, Aviaja Lyberth Hauptmann, Allyson Tessin, Eimear Tynan, Anne Merrild Hansen, Maria Ackrén, Silja Bára Ómarsdóttir, Elizabeth Buchanan, and Ingrid Medby. Danita Burke grew up in Newfoundland, Canada, where she pursued her undergraduate studies in Political Science and Business and a graduate degree in Political Science at Memorial University of Newfoundland. She also completed a PhD in International Politics at the Department of International Politics, Aberystwyth University in Wales, UK. Burke is currently based at the Center for War Studies, University of Southern Denmark where I was first a Carlsberg Foundation Distinguished Postdoctoral Fellow and she is currently a Marie Skłodowska-Curie Individual Fellow. 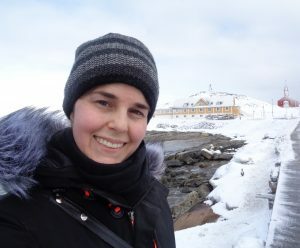 Her current project focuses on NGOs in the Arctic region and is supported by a Marie Skłodowska-Curie Individual Fellowship, but her research covers a range of themes. These themes include diplomacy and cooperation, legitimacy, institutional and organizational practices, evolution of national identity, environmental non-governmental organizations (ENGOs), and the role of militaries in the Arctic.